Those familiar with the breeding of Ozimals bunnies will know that their traits are not passed on using the classical gene model. Although Ozimals refer to a dominant and recessive list for eye and fur colours in their wiki, sometimes a dominant trait may be masked by a more recessive one. (Quote = “Before launch of the bunnies traits were divided into two categories. One being Dominant and one being Recessive. This list is weighted in FirstGen nests starting at 1 and going to the max number of genetics for that category. This means that having a chance to get the top level recessive genes in the list is much harder than getting the lower level Dominant genes. This makes the game challenging but fair for all that play. This means that it is incredibly difficult to assess the outcomes of various trait combinations because there are no additional clues on the way that traits are shown. For example, if you see a Holland Lop White rabbit in world, is the dominant gene a Holland Lop White gene (as you may expect) or is the dominant gene being masked by a more recessive one? 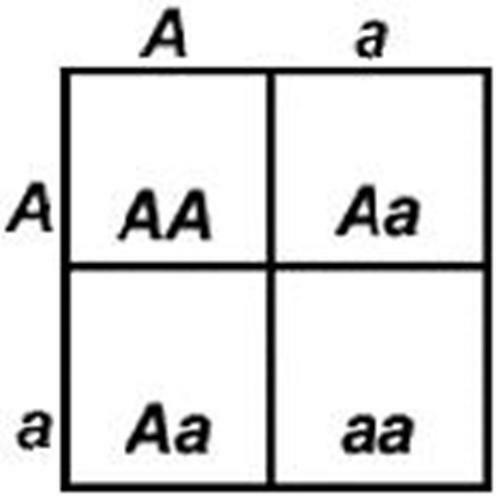 When it comes to the construction of a classical Punnett Square, how it is possible to accommodate the fact that a recessive gene may sometimes appear in dominance to a more dominant one? Although I do not wish to advocate that I have any stronger clues than other rabbit breeders about the process of determination offspring outcome, I began to ponder upon the problem of how this Ozimal discrepancy can be accommodated within the use of a typical Punnett Square. Simply as a mathematical exercise, I wondered whether the classical Punnett Square could be adjusted to allow for this feature. I wondered whether the two-by-two Punnett Square could be adapted by embedding four smaller two-by-two Punnett Squares within each quadrant to create a new four-by-four embedded Punnett Square. 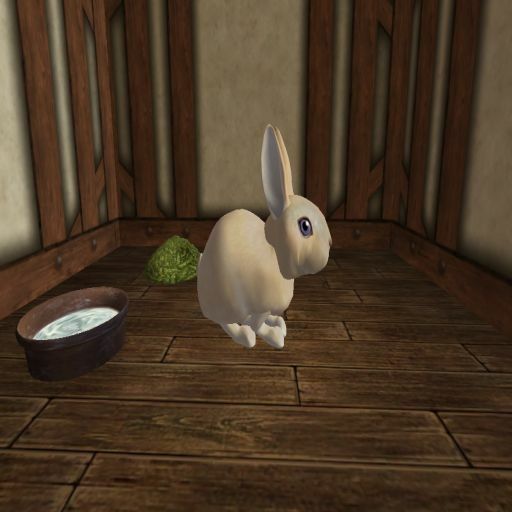 The larger two-by-two Punnett Square could be used to record which traits are passed onto the offspring and the four smaller two-by-two Punnett Squares that exist in each quadrant could be used to record which traits are then shown in the final kindled bunny. I called this method “The Embedded Punnett Square” and then applied the laws of classical probability to its construction. In total, there are sixteen sections in the Embedded Punnet Square but sadly, any Ozimal bunny has only fifteen generations. For the purpose of rounding and avoiding decimal answers in the following calculations, I have made a small approximation that each rabbit has sixteen generations in total. Therefore, each entry in the Embedded Punnet Square can be thought of as one of the produced nests from a mating. If you prefer exact calculations, simply multiply any of the following numbers in the following outcomes by 16/15 to correct this approximation. Those of you who know my rabbit breeding methods will understand that I prefer to use identical pairings. That is, for example, I will breed one Havana Blacks (with Garnet eyes) with another Havana Black (with Garnet eyes.) This is the way that the following calculations have been processed. So, to apply this nest analyst, simply allow a pair of identical bunnies to breed until all their fifteen generations have been exhausted and you have fifteen sets of data to analyse. Simply scan through the following outcomes and find the set of data that most closely resembles your outcome. The additional notes should provide the most likely explanation for your data. (Important: To make the mathematics easier to calculate, I have assumed that each rabbit produces a total of sixteen nests. (Simply because sixteen is made from two to the power of four, that is, 2 x 2 x 2 x 2) If you should require the exact answer, multiply any of the following totals in the following outcomes by 16/15 to convert. (1) If no nest shows a new trait. They only show their parents’ traits. Conclusion: It is highly likely that the parents were homogeneous. No useful inference may be drawn from the data. Repeat the next experiment with the same trait, but drawn from a different source. Approach a different breeder or vendor in the next experiment. (2) If the produced nests show one new trait, as well as their parents’ traits. Conclusion: It is highly likely that one parent was homogeneous and one parent was heterogeneous. There are two possible outcomes. Conclusion: The heterogeneous rabbit was showing the dominant trait. The new trait was recessive in that parent. Use the new trait. Conclusion: The heterogeneous rabbit was showing the recessive trait. The new trait was actually dominant. Do not use it. Revert to the parents’ traits in the next experiment. Do not use the new trait. (3) If the produced nests show two new traits, as well as their parents traits. Conclusion: It is certain that both parents were heterogeneous. There are three possible outcomes. Conclusion: Both parents had the dominant gene showing. Both new traits are more recessive. However, the third trait is the most recessive and is the one that should be used. Conclusion: One parent was actually displaying the recessive gene. The second trait is actually the most dominant and the third trait is the most recessive. Use the third trait. Conclusion: Both parents were actually displaying their recessive genes. The second and third traits are actually more dominant, the second trait being more dominant than the third. Revert to the parents’ traits in the next experiment. Do not use the new traits. When Kris, Skippy and I began breeding Ozimal bunnies, it was somewhat random. We knew that a natural ewlite would be produced by both a recessive fur and a recessive eye colour in both parents but our choice of which rabbits to breed was driven mainly by our own private preferences and a false perception of market forces. Obviously, very early in the experiment, we came to realize that the inflation of rabbit values on the marketplace were not due to their individual recessive traits but to their perceived worth by their owners or simply to a false expectation in wanting to gain the highest possible price for any particular sale. Our first pairings were somewhat haphazard. It was interesting to discover what new traits could be discovered, simply by allowing a warren of rabbits to breed randomly. However, it was impossible to delve into the genetic makeup of each rabbit using this method and we soon began to want to discover more about how the genetics operated. The first issue that we had to contend with was the fact that we wanted a 100% certainty with our results. If we had bred two different rabbits and obtained a different third outcome, there would be no way of determining whether this recessive trait was more recessive than either the mother or father, without having to waste further time and resources delving deeper into their genetic background. Therefore we decided to use an identical pairing – the “twining” method. Obviously, to gain a fuller width of different genetic material, we decided not to use sibling twins as there was a possibility that their recessive genes could be identical. Therefore we selected one particular fur and eye combination, such as the Havana black fur and garnet eye combination in this photograph, and then we would spend hours searching the market to find an identical match with which to breed it. Obviously, an elite can only be produced with recessive fur type and eye colour and so we never restricted the twining to shade or ear type – we were simply concerned with gaining an identical match with fur type and eye colour. Now, if the offspring was different in either of these two traits, we thought that we had found a more recessive gene. Next we would construct a further identical twin coupling using the more recessive genes that we had previously found so that we could delve deeper and deeper into the gene pool. We called this method “Drilling” – we were drilling as far as we could into the gene pool using exact identical matchings. Little-by-little our breeding experiment expanded and over the period of two years, we felt confident that we were very deep into the recessive gene pool because we had drilled so frequently and found many subsequent recessive genes. Now, traditionally, genetic results are recorded in the form of a Punnett square, showing the different genotypes of the offspring of a particular breeding pair. They usually take the form of a simple two-by-two grid and convention determines that each trait is shown by a similar letter, capital for the more dominant trait and lower-case for the more recessive. It soon became very clear that this approach was not suitable for recording the results of Ozimal bunny breedings. First of all, we are only interested in fur and eye traits, in order to achieve an elite offspring and for each of these two traits; not two but a huge range of variables are possible and each of these outcomes may be slightly more recessive or dominant than the others. Therefore, we adopted a similar approach but decided to use a Carroll diagram instead. A two-by-two grid was initially constructed. The first row and the first column of the Carroll diagram was completed with the known parental information, the visible fur type and eye colour, and then when a recessive offspring was born this additional information was added to the second row or the second column as appropriate. Each birth was shown as a single tally mark and a typical set of results would look as the one below. Again, typically, as predicted by the laws of probability, roughly three-quarters of the outcomes would be in the first quadrant of the grid, the remaining one-quarter would be spread in the remaining three quadrants. This is what would be expected with a heterogeneous coupling (One in which the dominant genes are different to the recessive genes) and it verified that we were taking a sound approach. Luckily, for us, it was very rare to find a homogenous coupling (One in which the dominant and recessive genes were identical) because if this had of happened then all the tally marks would have occurred in the first quadrant and it would have been impossible to find a recessive gene in that instant. Thankfully for the purpose of our experimentation, the rabbits that we used came from breeders who were somewhat haphazard with their breeding programmes and so we never wasted much time having to deal with any homogenous couplings. After a year of continuous drilling, we had amassed a large amount of data and it was becoming difficult to compare results and visually represent how our results were progressing. It was then that we decided to use a different graphical representation and I was inspired to propose a flow diagram after studying a picture of the London Underground. If you are familiar with the London network, you will know that the physical presentation of the stations has no bearing on their graphical location. In fact, a Londoner with good local knowledge is able to simply walk out of the doors of one station, along the street and into another when their perceived locations are actually shown as being very distant on the graphic representation. The above map is used to simply show how the stations are connected. The actual underground looks somewhat more like this. Using this principle, our results for fur and eye colour were mapped out symbolically. Remember that the physical positioning of each trait has no bearing on how recessive or dominant it actually is. 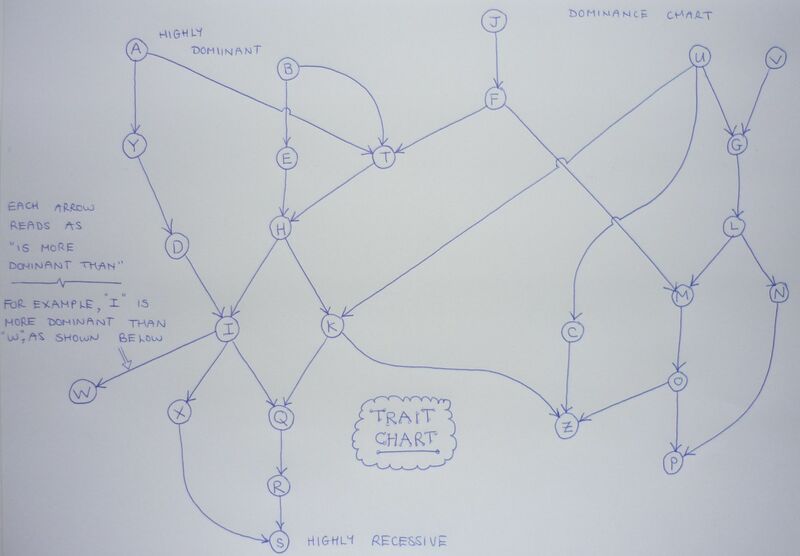 These trait maps are meant to be read by comparing the number of links in each chain. The arrowed lines may be read as “is more dominant than” and so, the most important thing is to find a chain with as many links as possible, then to look at the bottom of that chain to find the highly recessive genes. 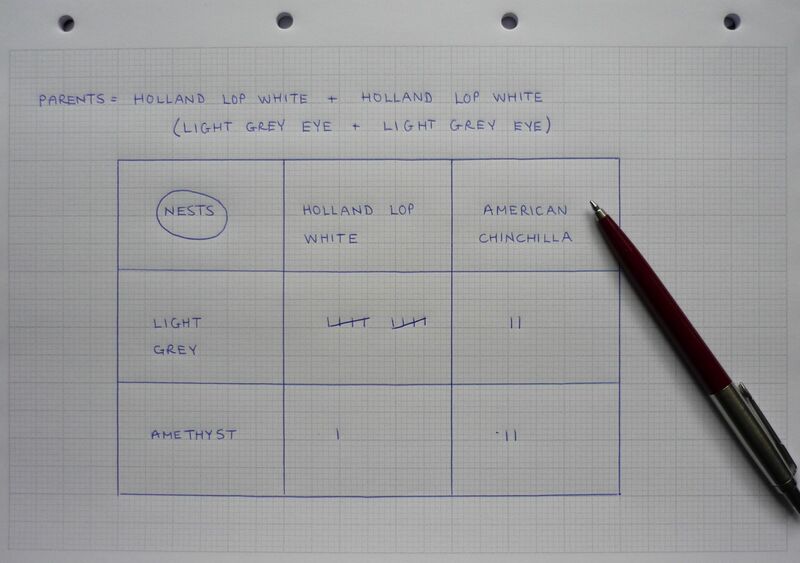 We built two of these charts, one for fur type and one for eye colour. These two charts are precious to us and they are both kept very safely hidden away for reference. The above diagram is merely a symbolic replication of what we had recorded. We have no wish to spoil the fun and enjoyment of others by reproducing our results in this blog. Using these results, we had “drilled” down very deep within the fur types and eye colours but we knew that there was more work to be done. Now, this is where the problems start to occur. Over the course of the two years, we have noted some very strange results. Using identical twins it is, of course, quite possible to breed a different offspring and this is exactly what we have been trying to do over this time. However, if a twining of two identical mini rex black otters should produce first an English spot black baby and then, a few weeks later, a Havana broken black baby, it is simply nonsensical and completely defies the classical gene model that we have been using. Of course, it is very possible for two mini rex black otters to produce an English spot black offspring if the both of the two recessive fur type genes from each parent are present in their subsequent baby. Quite obviously, the offspring has been born from the recessive genes of each parent and the more dominant of these two recessive genes is making the phenotype of the offspring an English spot black. However, if the combination of these two recessive genes produces an English spot black in the first instance, it is worrying that a second pairing of the same genes should then produce a Havana broken black. Something has gone wrong with our classical gene model. There are obviously other factors in play that we have not taken into account. I must confess my first instinct was to simply abandon the game. I confided that it felt like we were playing a game of blindfolded football and, after feeling the position of the goal posts using our hands and then processing to find the ball, the goal posts had been moved to a new unknown position so that we were unable to kick the ball in the right direction, when wearing our blindfolds. However, the change in the phenotype had occurred directly after an update and we initially assumed that the update had altered the recessive genes in some logical manner. We knew that each update inserted new genes into the gene pool and we assumed that these genes were added randomly as recessive and dominant at various points in the overall gene structure. Perhaps it was this, we thought, that had caused this first issue to occur. Interestingly, directly after the next update, the same problem was recorded with the eye colour. This time, an amethyst eye identical twin pairing produced a light hazel offspring before the update but a peridot eye colour after the update. Again, since the issue occurred before and after an update, we decided that the update had simply inserted new genetic code into the overall structure and had caused this blip. However, the third (and most recent) time this issue has occurred, no update had been performed. Again, this made us doubt that we were using the correct genetic model in our thinking. 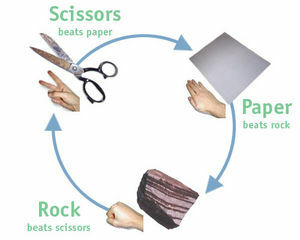 In addition, in the children’s game “Paper, Scissors, Stone” (shown as “Paper, Scissors, Rock” in the diagram below) the traits of paper, scissors and stone are non-transitive. There is no “strongest” result. Paper is better than a stone, the stone is better than the scissors and the scissors are better than paper. The flow diagram for this can be shown as a closed loop. However, many more other characteristics, such as length, temperature, weight, number size, strength and (most importantly) dominant/recessive are transitive. 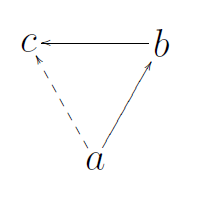 If “a” is stronger than “b” and “b” is stronger than “c” it follows that “a” must also be stronger than “c” by applying simple logic. We found that blue zircon was more dominant than dark grey and that dark grey was more dominant than light green. However, we also found that light green was more dominant than blue zircon. Using this principle of transitivity, the results of blue zircon, dark grey and light green eye colour simply don’t make sense. Using an apparently fail-safe protocol of twining identical pairs, we had come across three different conflicting issues. At first we thought, perhaps, that Second Life has introduced multiple errors into our experimentation or perhaps, we thought, there are other factors that have come into play. Speaking with Ozimals staff, we found that there was one last additional factor that we had not taken into account. It was easy for us to incorporate this into our strategy and then continue with the game. Perhaps one day we may reach the most recessive fur type and and eye colour. It’s going to be a long path, but a fun one to travel.